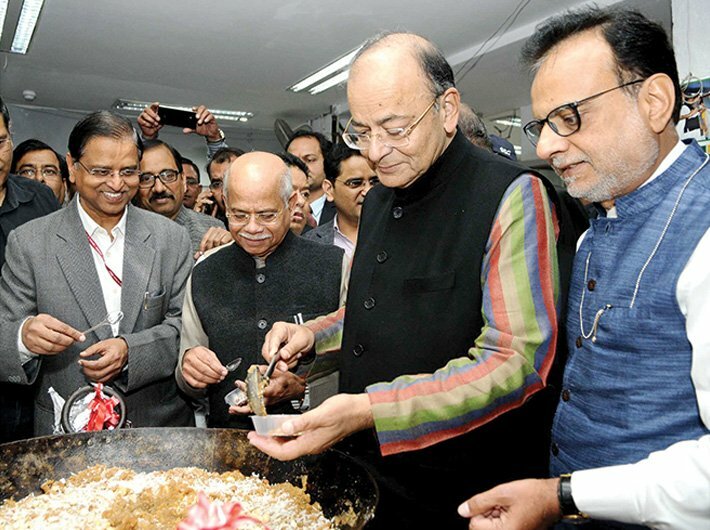 Finance minister Arun Jaitley at the ‘Halwa ceremony’, a tradition that marks the beginning of the budget printing process, on January 20. Also seen are minister of state Shiv Pratap Shukla, finance secretary Hasmukh Adhia and economic affairs secretary SC Garg. Cloaked in obsessive secrecy, our budget process is rooted in our colonial past. By a single document, the government tries to lay down the roadmap of the economy for the coming financial year. It is quite another thing that the complexities of modern finance force the government to tinker with the economy throughout the year. It is a matter of recent memory that the two most important financial decisions of the present government – demonetisation and GST – were not even discussed in the budget. Another major shortcoming of our budget process is that the emphasis is on monitoring spending by government departments, not on monitoring the end result of the money spent. The result is that after 70 budgets and spending humungous amounts in each budget, more than 40 crore Indians still struggle for roti, kapda and makaan. Every budget speech would have us believe that we are on the threshold of economic nirvana; somehow we never manage to cross that threshold. Yet budget time is like a mela; with everyone hoping that some freebie or discount will come his or her way. Lobbyists are busy traversing the corridors of the finance ministry, putting up their case to anyone who would listen. Financial newspapers are full of speculation about the contents of the yet to be presented budget. Can we have a better budget process? First of all, we have to understand that budget secrecy was necessary earlier because unscrupulous elements would have made unconscionable profits if they had advance intimation of change in income-tax and excise rates. But there has been no change in income-tax slabs since 1991 and GST rates are set by the GST council. So, there is no need for fortifying North Block like Fort Knox at the budget time. Rather, the government should disclose the main budget provisions well in advance so that public can discuss the pros and cons of the proposed changes. Today, only some trade associations and top industrialists get this privilege. Since the budget affects the common man much more than the wealthy, better suggestions may emerge from this exercise. The Economic Survey is supposed to give a SWOT (strengths, weaknesses, opportunities and threats) analysis of the economy, but tradition dictates that the it is presented only a day before the budget, leaving no time for a meaningful debate. Moreover, as I discussed in a previous column, “The Missing Links” (Governance Now, July 11, 2017), the present government has pointedly ignored almost all suggestions made by its own economists in the Economic Survey. Successive budgets have been omnibus documents incorporating an almost equal number of financial and non-financial provisions. Budget 2017 had 150 provisions and ran into 85 pages incorporating provisions for abolition and amalgamation of tribunals side by side with provisions for changes in tax rates. Lack of majority in the Rajya Sabha may have necessitated inclusion of non-monetary provisions in the Finance Bill but this exercise has surely made the budget lose its focus. Each budget introduces a number of schemes, abolishes some and renames a few others. Except for some flagship schemes like MNREGA, no one is bothered about the operation of the rest of the schemes, which come in the limelight only when they go awry. The government generously opens its purse strings for promotion of these schemes – almost one-third expenditure of the last budget was on its schemes. The worst performers are the centrally sponsored schemes which are funded by the centre but implemented by the states. The state bureaucracy perceives them as milch cows, and the centre does not have operational control over these schemes. The simple expedient of dovetailing state budgets with the union budget, so far as centrally sponsored schemes are concerned, may take care of this problem. However, the perpetual centre vs. state tussle may prevent the implementation of any such solution. A change in the public mind, which views the budget as a panacea, is also required. Come budget time and all pressure groups, associations, confederations become active, lobbying for sops for their clients. Some armchair economists (like yours truly) start offering gratuitous advice. However, the government’s capacity for generosity is highly limited given inflation, unforeseen international developments (like hike in petroleum prices) and the Fiscal Responsibility and Budget Management (FRBM) Act. One sector’s gain can only be at the cost of another’s loss. The government needs to apprise the public of this reality – even at the risk of losing its mai-baap image. For a people raised on platitudes and explanations for failure, an honest confession by the government would definitely hurt but a rude shock is preferable to permanently living in a fantasy world. Lastly, there has to be a change in the basic philosophy of the budget. Since the beginning, we had a top-down budgeting process with the mandarins of North Block deciding what is good for the rest of us and how we can hope to achieve it. The time has now come to try the bottom-up approach. Each village should decide upon the changes it wants in the coming year. Village-level plans should be aggregated at taluka level, district level, state level and finally at the national level. Decentralised planning would cut down expenditure because spending would only be on identified needs and only to the extent that money could be used productively. Since we would have small-size plans at the village and block levels, outcome would be easy to monitor and failures would get pinpointed.